After the Ray Rice debacle, Roger Goodell talked a lot about making the NFL a leader on the issue of domestic violence. And, like any good corporate leader, what better way to show your leadering than by issuing weekly update memos? In three weeks, Goodell has issued three memos, enough to provide in-depth analysis of everything the commissioner has done to help the league be at the forefront of this issue. 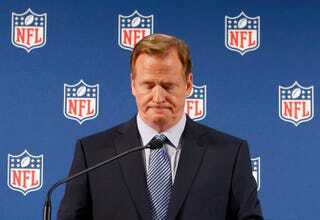 The analysis: Goodell has talked to a lot of people about domestic violence. Early on, Goodell made a few moves. In his first memo, Goodell announces that the NFL will support the National Domestic Violence Hotline—a good thing, although details on how much and for how long have been left at "multi-million dollar, multi-year commitment." He also announces that "comprehensive information" on domestic violence resources available in different areas were given out to teams. He closes on a note of optimism: "We will continue to work with experts to expand and develop long-term programs that raise awareness, educate, and prevent domestic violence and sexual assault both within the NFL and in our society in general." But Goodell's tone in the memos soon becomes less aggressively optimistic, perhaps rightly so. Domestic violence is a complex issue, with cycles of abuse, hidden suffering, and victims who will defend their abuser. This isn't an issue you can legislate away with a new rule, or a behavior you can scare people out of with a few over-the-top punishments. Goodell can't do exactly the type of things he usually does in this situation. So what the commissioner left with? Well, he's talking to a whole lot of people! In his Sept. 26 memo, he goes into great detail about how he talked with DeMaurice Smith and several NFLPA representatives, then he talked with former players and some people with law-enforcement backgrounds, and then he talked with officials from the U.S. Army about how the military handles misconduct. He also announces a celebrity-laden PSA against domestic violence that aired during football games, and closes the memo talking about the donation to the hotline—the same accomplishment he'd already touted the week before. He ends on a not-super optimistic note: "We will continue consulting with leading outside experts, law enforcement and judicial professionals, religious and business leaders, academics and players, both current and retired. As we do so, we will continue to provide you with information and look forward to a thorough discussion of these issues at the upcoming league meeting." Hey, what happened to preventing domestic violence in society? Another week goes by, and today's memo is another update about talking. First, they talked to people at the hotline, then they talked to more former players, then they talked to Charlie Strong, then they talked to a new expert added to the NFL's group of experts, then they talked to the heads of two associations for parents of pro football players, then they talked to the USA CEO of the YWCA, and then they talked to 17 members of the Black Women's Roundtable. Goodell also makes sure to mention the donations to the hotline and the PSAs, again, in case anyone forgot about those. This time, he closes on a downright ho-hum note: "We look forward to discussing these and related matters with you at next week's league meeting in New York. If you have questions in the meantime, please feel free to call me or Deana Garner, Anna Isaacson, Jeff Pash or Troy Vincent." Goodell does have some actual news in today's memo near the end: the appointment of former federal district judge Barbara Jones to hear and decide on Rice's appeal of his indefinite suspension. It's probably no surprise that Goodell didn't make that the top item. After all, he had so much talking to talk about.